The kindergarten to grade 5 old school at the foot of Derby Hill in Derby, Maine is gone. The style of the bulding was pre-1900 with a huge bell as barely shown in the photograph here. When I attended in the 1950’s, recess ended with one happy kid yanking on the thick rope upstairs while children rushed to line up according to grade at the entrance. The rope yanking bell ringer was selected moments earlier by either the principal or recess monitor. Things began to change in the 1960’s. Derby was a railroad town and depended on the demand for rail transportation (and, yes, passenger service) for sustained growth. The post WWII economy with affordable cars plus modern methods of shipping were the beginning of the end. Aging boomers kept the population of Derby steady at around 300 while fewer children meant the schoolhouse wasn’t cost effective. 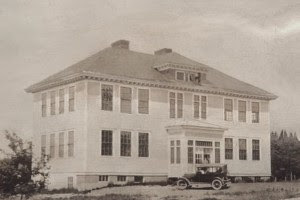 The school was demolished in the late 1960’s not long after I moved away, and students were bussed to Milo Elementary. Graduation from the 5th grade in Derby meant going to Milo and joining a much larger group of unfamiliar faces. Derby graduates spent the first year in the Milo Elementary School feeling like you were from outer space. Next came 2 years at Milo Junior High, a building about the size of Derby Grammar, and the circle of friends began to grow. Finally you arrived at Milo High School where most of us graduated 4 years later. Coming from Milo and rounding the top of Derby Hill to descend into the village just isn’t the same with the old school gone. My Dad attended the same schoolhouse and both parents graduated from Milo High School. As of 1968 it’s gone, too, although it survived and was converted to a senior citizen home.